“Where are you going for your birthday party?” one of C.J.’s girl friends asked him while they were play-dating at our house the week before his birthday. “West Hollywood,” he said casually, as if every second-grader in Orange County knows what and where West Hollywood is. “Cool,” his friend said as she smiled and nodded, even though I could tell that she had no idea what he was talking about. Six months prior, C.J. 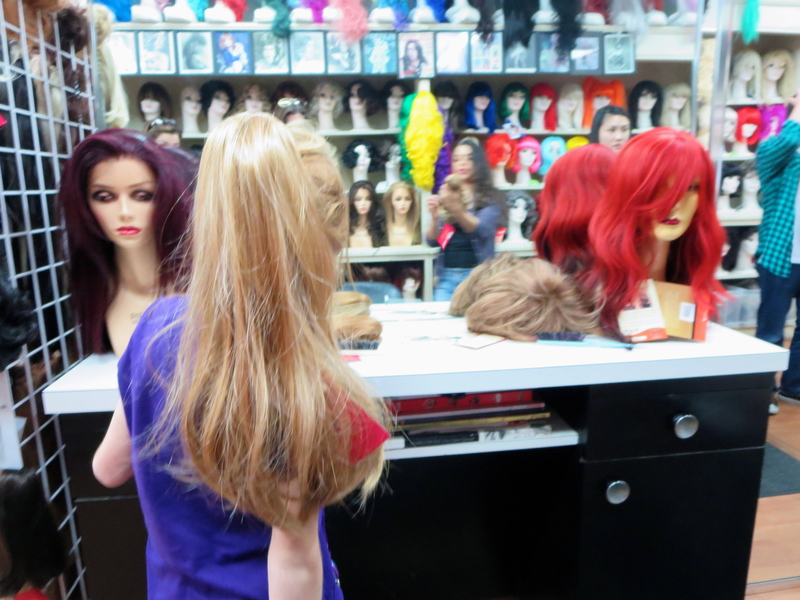 decided that he wanted to have his birthday at a wig store. I thought for sure he’d change his mind, because he does that a lot. But, he repeatedly mentioned it and by November, I knew that I had to try to make it happen. So, I enlisted the help of my brother, Michael, who lives in West Hollywood, and gave him a list of things that C.J. wanted to do in celebration of his eighth birthday. On the morning of C.J.’s birthday party day, we woke up and drove 30 minutes to my best friend Marie’s house to pick up her and her two daughters (the dads stayed home to work). Her daughter Grace is four weeks older than C.J. and they are besties through and through. If you need proof, you can read their matching shirts that say “I heart my bestie.” Marie’s daughter Kate is one of Chase’s best friends despite her being three years older than he is. They share a love of bacon, Modern Family and making each other laugh. 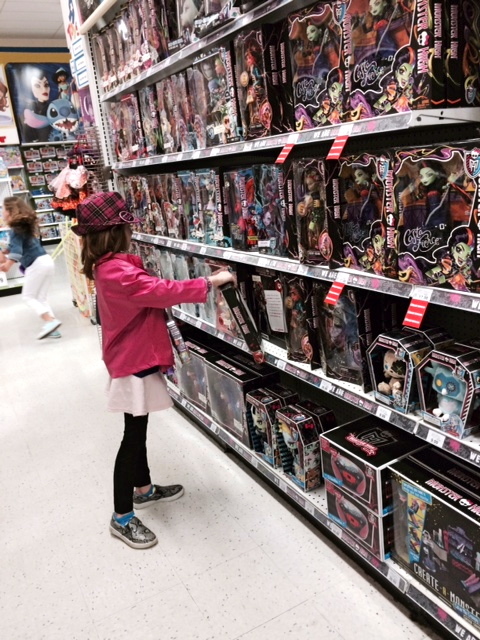 We took the kids to the Toys R Us near Marie’s house to check “go shopping for toys” off of C.J.’s birthday party to-do list. C.J. selected some Shopkins, a Monster High pen and a Ballerina marionette. An hour later, we were in West Hollywood greeting Uncle Michael and six of his closest friends at The Abbey – which has twice been voted the best gay bar in the world and was Elizabeth Taylor’s favorite pub. Rest assured that at noon on a Saturday, the crowd was tame and family friendly. We were escorted to a secluded table on the patio and C.J. promptly handed out pink mardi gras beads to his guests (no flashing required). Because they were sitting across from me and next to each other, Uncle Michael helped C.J. decide what to eat. Imagine my surprise when C.J. ordered Nutella crepes for lunch. 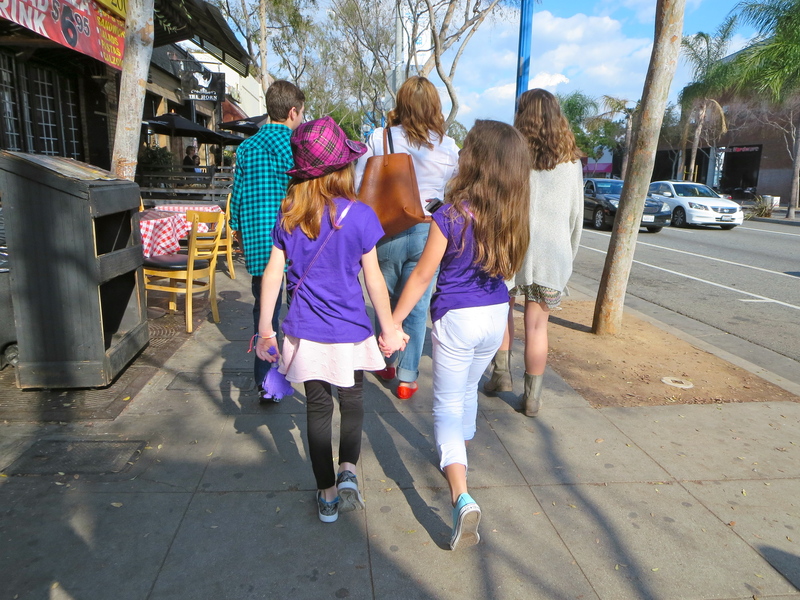 After lunch, the 13 of us (three straight females, six gay men and four children – for the sake of setting the scene) walked in parade fashion up Santa Monica Blvd. 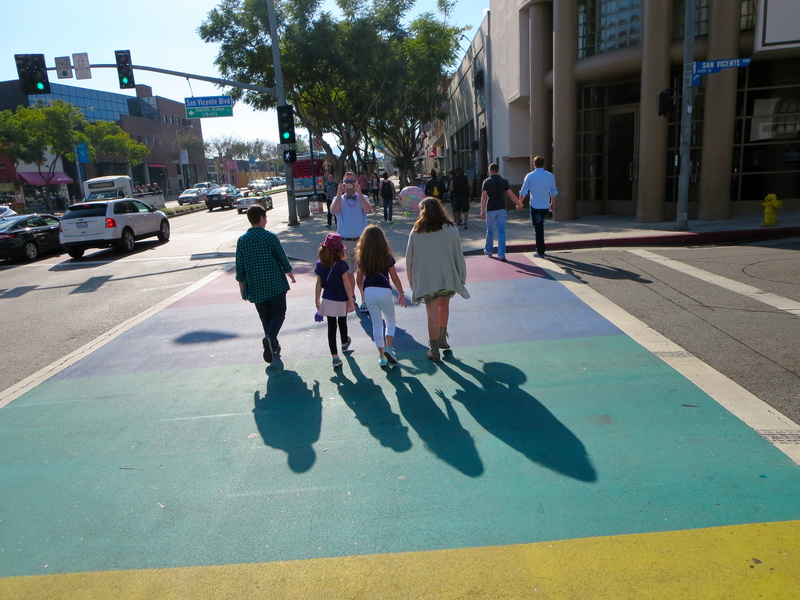 to the crosswalks painted rainbow. We crossed the street taking pictures all the way. Then, we turned around and crossed again. Then again. Then again. People took pictures of us taking pictures of ourselves. 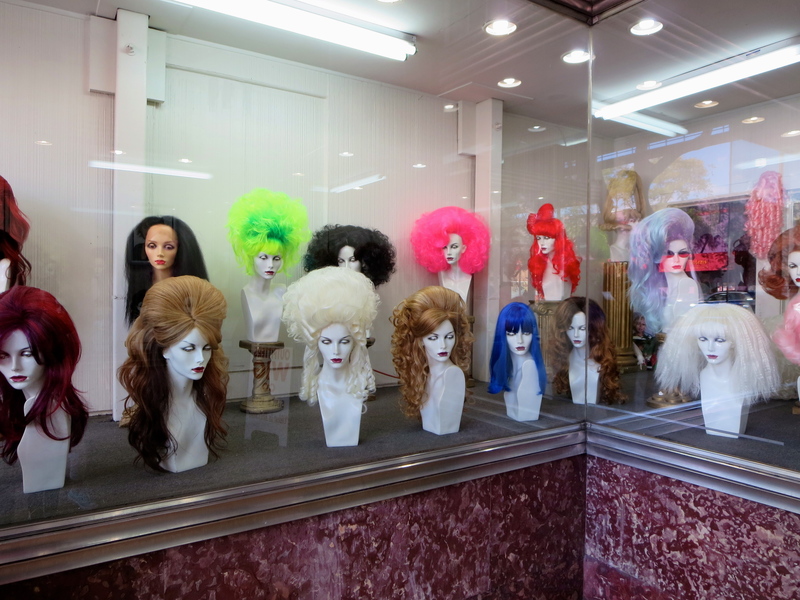 We paraded back to our car and drove to the wig store of Uncle Michael’s choosing. 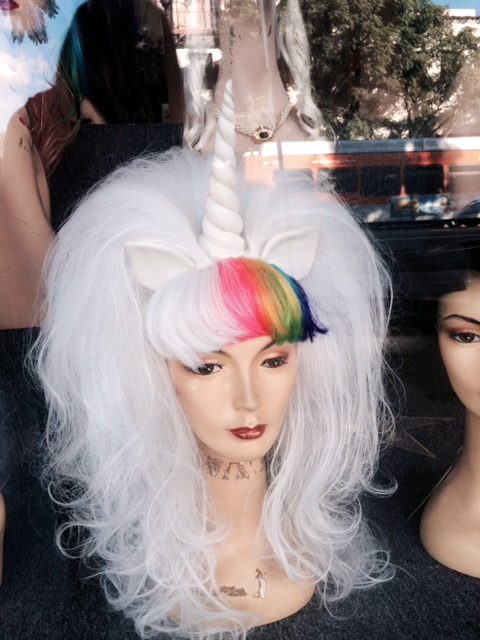 Though they didn’t seem excited to see us rush into their store initially, the staff of three joined our party when they realized that we were celebrating a unique boy who likes wigs and falls more than just about anything else. 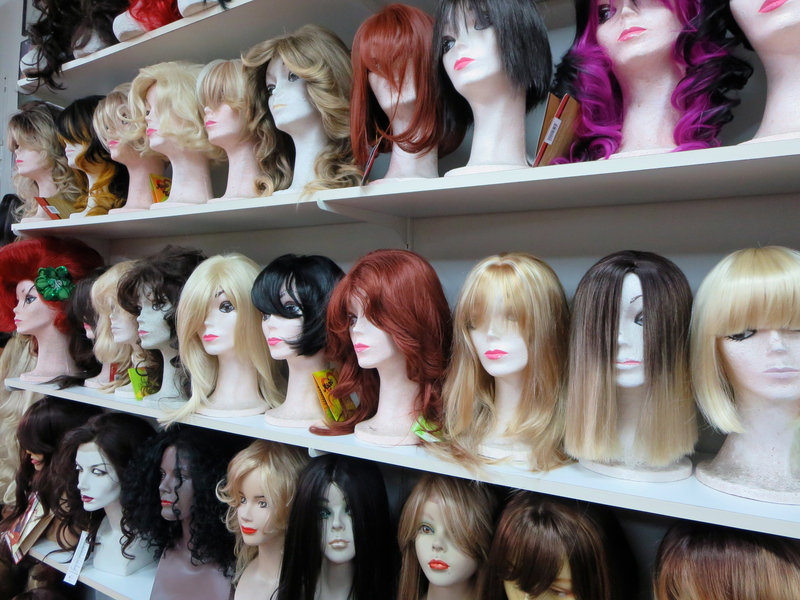 Every member of the group chose one wig to try on. When C.J. fell in love with a fall that matched his one-of-a-kind hair color perfectly, I bought it for him and he wore it out of the store and the rest of the day. At a neighboring toy and costume store, C.J. carefully deliberated which souvenir Oscar to award himself. Eventually, he bypassed the awards for “Best Diva” and “Drama Queen” for a win in the “Best Son” category. “Because don’t you think I’m a better son than diva and drama queen?” he asked me looking for reassurance. I agreed. Back at Uncle Michael’s place, we ate pink cupcakes, opened presents and sang along to popular Disney tunes that were blasting. C.J. fell asleep on the way home — as he always does after a long, fun day in West Hollywood. “That was the best birthday party! I’m going to tell everybody at school that they should have their birthday parties at West Hollywood,” C.J. said next day. West Hollywood, if you see an influx of children’s birthday parties in the coming months and years, remember who started the trend. A huge, heartfelt thank you to everyone who attended the West Hollywood Wig Out Birthday Spectacular and made the day beyond special for C.J. Your acceptance and love for our family is profound and it’s quietly letting our kids and their friends know that it’s okay to unabashedly be themselves. 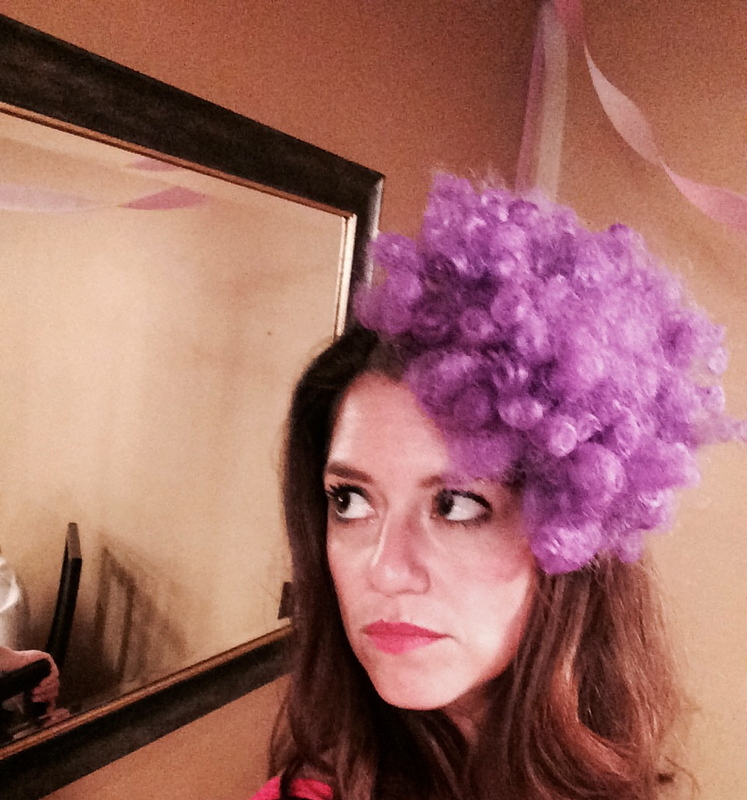 This entry was posted in All Posts and tagged Birthday, Birthday Party, gender creative, gender nonconforming, LGBTQ, Monster High, parenting, The Abbey, West Hollywood, wigs. Bookmark the permalink. Hi! I just finished your book and am now officially a fan. Both of you as a mother and CJ as a fabulous, special individual. Your book taught me so much and I wish EVERYone would read it. Acceptance is everything. You are a superb mother don’t ever let anyone tell you otherwise. I will continue to follow your story, I’m very interested to see CJ grow up. 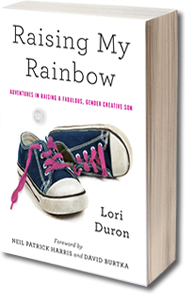 Raising my rainbow…. the title itself is so beautiful. ..
Have loved reading this blog, its so nice that you have accepted who your son is and embraced it. So many would say it’s a “phase” it’s refreshing to read about such an amazing family. Wish more were like you. Hope he had a good birthday, looked FUN. I wish that my mom was that supportive when I was C.J.’s age. Lori, bless you! I have really have loved the way that recent posts on special occasions have evolved. It used to be about balancing letting CJ be himself with the fear of what reactions he might get but now seems to be just about everyone just having fun. It’s really easy to say “I don’t care about what other people think” but it’s much harder to live that way especially when it comes to our kids. I know after I became a mom, people could say what they wanted about me, but I can think of moments where someone was mean to my son years ago and it will still sting like it just happened. So I now this has not been an easy path but it sure has been amazing from what I can see. Happy Birthday CJ!!! Oh, and I can’t believe he found a fall to match that gorgeous hair color! What a beautiful and joyful birthday. Acceptance is so easy. Differences are colorful and spicy and make life so much more enjoyable. I hope and pray one day every child knows the same love and joyful acceptance that C.J. does and that instead of seeing what makes us different, we revel in the fact that we are not all the same. Happy Birthday C.J. Glad Im following you, your post are amazing! Glad to see happiness in this family! What a phenomenal birthday celebration! Happy Birthday CJ!! I think I have something in my eye. Thank you for sharing. Happy birthday C.J. I have 14 children and I would be proud to have one like C.J. What a fabulous birthday party! CJ and my Dad share the same birthday. I can assure you it wasn’t walking around in short sleeves weather here though. Lori needs a “Bestest Mom” faux-Oscar! And I’m so happy that CJ got to have the wig party!!! I just started following and i am so glad I did. What a great mom role model you are and CJ sounds awesome! Can’t wait for the next post! I have been checking everyday for part II! 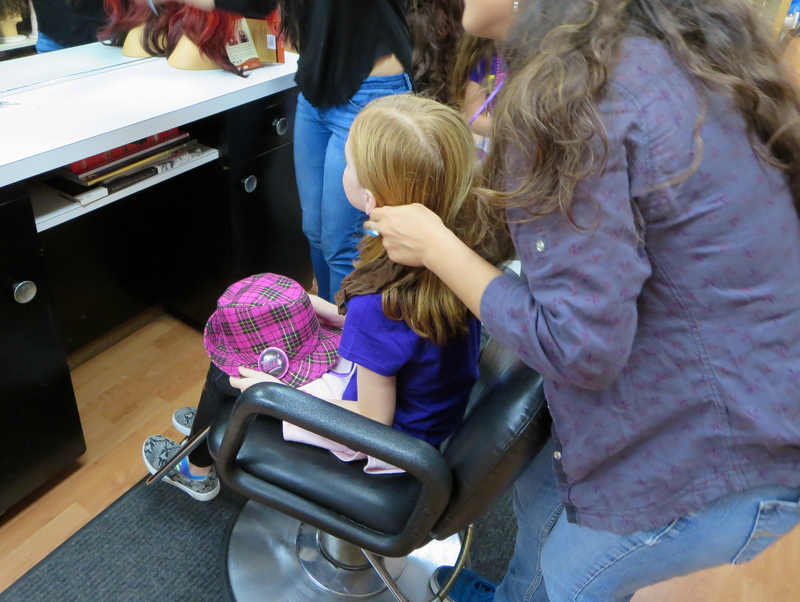 I’m thrilled that CJ got his wig party! Great party for the birthday boy! Every kid, no, make thar every person should get to have the day they’d have the most fun doing. Oh how I love C.J. and the adventures you have. What a wonderful son you have! Thank you for sharing your family with us! Glad it was such a fun party! C.J. and his friends will be telling this birthday party story well into the beginning of the 22nd century. Posted this on Facebook. 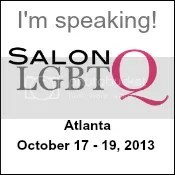 Maybe it will go viral…SO FABULOUS! It’s wonderful that you were able to do what your rainbow wanted, I remember when I was small I had a big Tonka toy truck ‘thing’ and my Dada took me to a huge open cast mine to see the real life trucks- I walked in air for months after! You’re the best Mom! Sounds like great fun! So glad you were able to pull off the party of his dreams. Happy Birthday, C.J. From Down Under. What a great family you are! It is my desire to help many people celebrate their birthdays in whatever way makes them happiest. How awesome! Happy birthday, C.J. !